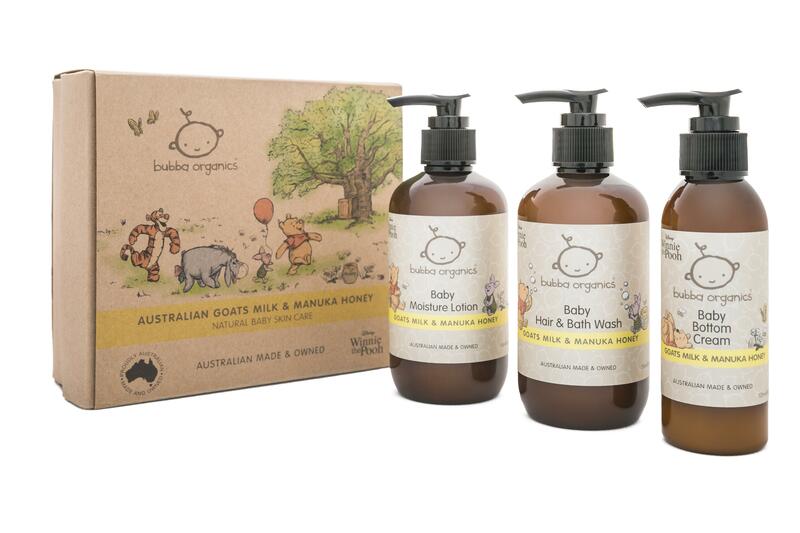 Inspired by Winnie the Pooh and his love of honey, Bubba Organics announces its launch of a baby hair & skin care range in collaboration with The Walt Disney Company Australia. Bath time will become a whole lot more fun for little ones, the Winnie the Pooh-inspired collection boasts a gentle mix of creamy fresh Australian Goats milk and antioxidant and vitamin-rich Manuka honey. As well as the time-honoured healing properties of Manuka honey, the 100% natural range features aloe vera and jojoba to lovingly nourish and moisturise bubba’s skin, with sweet almond oil to nurture luscious locks. Delicately scented with orange blossom, these products will keep bubba silky soft and soothed from head to toe. Australian Goats Milk & Manuka Honey Baby Hair & Bath Wash (250ml): Safely cleanse and nourish baby’s skin and hair with this extra-gentle, pure and organic formulation. For some bubbly bath time fun, add to running water for bubbles galore. Australian Goats Milk & Manuka Honey Baby Moisture Lotion (250ml): Dry skin is simply “un-bear-able,” so after bath time use this comforting lotion to hydrate precious new skin with a natural and ethical formula enriched with vitamins and antioxidants. Australian Goats Milk & Manuka Honey Baby Bottom Cream (125ml): Perfect for soothing & helping to prevent nappy rash, this velvety cream softens and calms skin without irritation. Blended with the antioxidant-rich creaminess of pure, fresh Australian Goats Milk, the lotion is naturally anti-inflammatory and antibacterial. With the added benefits of aloe vera, olive fruit oil and shea butter, this product has been lovingly formulated to protect bubba’s delicate derrière. Australian Goats Milk & Manuka Honey Baby Essentials Gift Box: Give the gift of natural baby skin care with the Australian Goats Milk & Manuka Gift Box. Developed to make caring for baby’s skin a simple pleasure, it’s the perfect gift for new parents. Since its launch in early 2016, Bubba Organics has been providing Australian families with truly natural, premium skin care products. Committed to being a brand that parents can trust – an ethically produced, Australian Made skincare line genuine about transparency. Nothing hidden or harmful, just the very finest naturally sourced ingredients chosen for their proven effectiveness and suitability for extra-sensitive skin. Bubba Organics is an ECO award-winning brand and a respected name in natural baby skin care. Though originally developed with precious babies in mind, Bubba Organics premium products have become essential care for the whole family – particularly those with skin sensitivities and dry skin conditions. These exclusive products will be made available via Bubba Organics dedicated online store along with 200 Australian and New Zealand approved Bubba Organics Stockists from October 22nd.